Pet Emergency? Call us right away at (618) 694-0299! 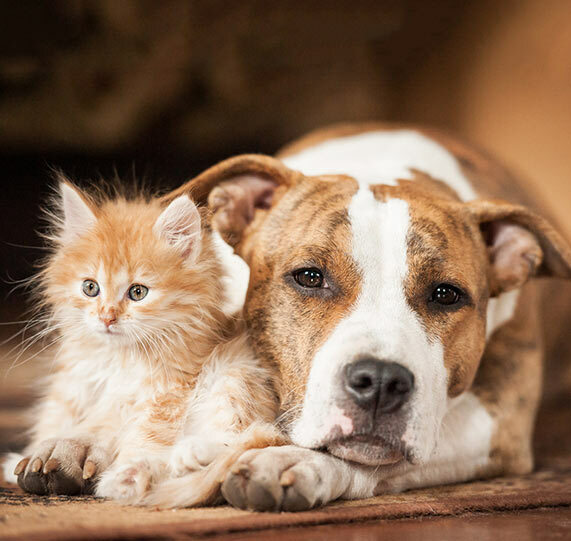 IIf you live in Thompsonville or the surrounding area and need a trusted veterinarian to care for your pets – look no further. Dr. Craig Smith and Dr. Allen Hodapp are licensed Illinois veterinarians, treating all types of pets. Your pets’ health and well-being are very important to us, and we take every possible measure to give your animals the care they deserve. Thompsonville Veterinary Clinic is a full-service mixed animal hospital and welcomes both emergency treatment cases as well as pet patients in need of routine medical, surgical, and dental care. Both doctors have years of experience treating serious conditions and offering regular pet wellness care. Beyond first-rate pet care, we make our clinic comfortable, kid-friendly, and calm, so your pet can relax in the waiting room and look forward to meeting our small town veterinarian. We also offer a variety of services for your large animal needs, including vaccinations, dewormers, Veterinary Feed Directives, and emergency farm calls. Give us a call and we will be happy to discuss what we can do to help. We are happy to offer a number of resources that enable you to learn about how to take better care of your pets. Please feel free to browse our site, particularly the informational articles. The best veterinary care for animals is ongoing nutrition and problem prevention, so becoming knowledgeable about preventative pet care is essential to the ongoing success of your animal’s health. If you have any questions, call 618-627-2222 or email us and we'll promptly get back to you. Our veterinarian office is very easy to get to -- just check out the map below! We also welcome you to subscribe to our newsletter, which is created especially for our pet owners. At Thompsonville Veterinary Clinic, we treat your pets like the valued family members they are. Dr. J. Craig Smith is the Practice Owner and Senior Veterinarian at Pet Wellness Center, PC. Dr. Smith graduated from the University of Arkansas with a Bachelor's Degree in Animal Science. He received his Doctorate of Veterinary Medicine from Louisiana State University. Dr. Smith has special interests in surgery, internal medicine, dermatology, and dentistry. He has two pets of his own; a yellow labrador retriever named Sadie and a quarterhorse horse named Jesse. Blessed with a large family, he and his wife, Cera Smith, have five daughters: Ashley, Cera Ann, Jessica, Katherine, and Lauren. When he's not practicing medicine at the clinic, you can find him showing horses and raising his cattle. His compassionate nature and dedication to helping people and pets has helped shape Pet Wellness Center into an industry leader in veterinary excellence. Dr. Allen Hodapp is an Associate Veterinarian with the Pet Wellness Center. He joined the practice in 2013, after practicing in Sparta IL. He received his Doctorate of Veterinary Medicine from the University of Illinois in May of 2011. His interests in the veterinary field started very early in his childhood. He would spend days helping at his grandparents dairy farm. He has special interests in large animal preventative medicine and education, as well as small animal radiology, dermatology, and neonatology. When not working with animals, Dr. Hodapp can be found fishing, biking, and spending time outdoors with his two dogs, Roman and CJ. He is looking foward to getting to know you and your beloved pets while providing quality veterinary care to them. "I took my small pot belly pig "bacon bit " there for surgery and they were so very friendly and caring. Gave us great information. We highly recommend them." "I have yet to find another veterinary that can compare to Thompsonville Veterinary Clinic. They are far and away the best of the best, and provide vet service with efficiency, professionalism, and that precious commodity: compassion. I cannot recommend them enough." "This clinic is by far the best place in southern Illinois. They listen to all your questions and concerns and even follow up with a phone call. The staff is top shelf and always very loving to your pet. I feel I have found the best medical care I possibly could for my fur baby."